Celebrating more than 70 years of hospitality, Best Western Hotels & Resorts is an award-winning global family of hotels located in over 100 countries and territories that offers accommodations for all types of travellers. Guests can select from 10 unique hotel brands: Best Western, Best Western Plus, Best Western Premier, Vīb, Glō, Executive Residency by Best Western and BW Premier Collection; as well as Best Western's recently launched franchise offerings: SureStay, SureStay Plus and SureStay Collection. Independently owned and operated, each brand has its own personality and style, but all share the same commitment to delivering superior customer service, exceptional value and modern amenities. Discover more information about this iconic brands including information on our executive team, who are recognized throughout the industry and beyond for their leadership and vision; our commitment to supporting local charitable efforts around the world; and information for developers interested in adding a Best Western hotel to their portfolio. 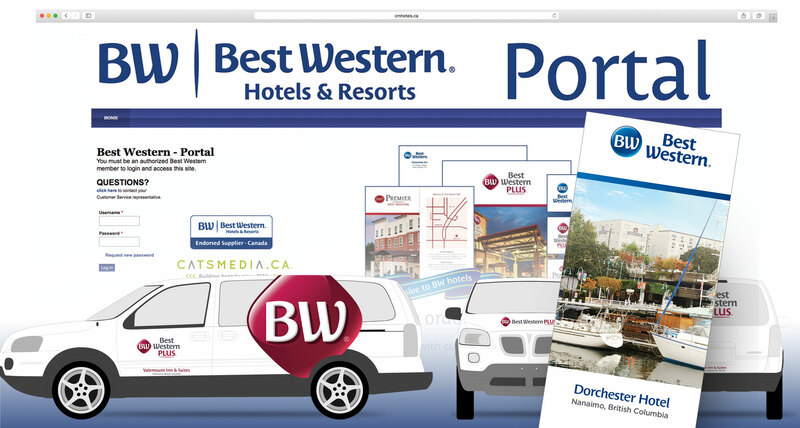 Cats Media was tasked in providing not only a website portal for Best Western's Canadian hotels but implementing the new brand design and refresh for their operations coast to coast. The Best Western Portal was created so that individual hotel locations could directly order the supplies and stationery they require to run their businesses day to day. Due to the high volume of service and shuttle vehicles it was important that their brand stand out so Cats Media was also asked to design vehicle wraps for a number of their fleet vehicles. The bold “BW” is easily recognizable and sets the Hotel chain apart from its competition. In addition, various brochures, maps, notepads, flyers and posters were created for their many concierge outlets.